Cravings are really frustrating! I totally understand, I’m a woman with hormones too. Getting on to the right kind of diet to help eliminate cravings is the first step. The diet I’ve found most beneficial to do this is the Ketogenic Diet. I’ll shamelessly promote my book here and give you the link. 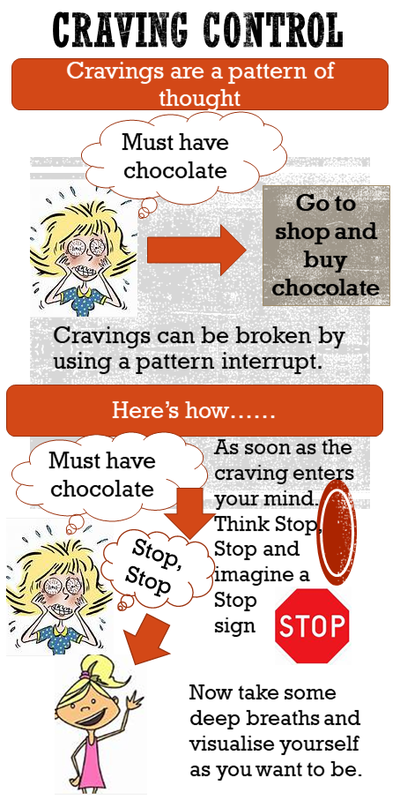 We often end up doing these loops of behaviour such as, feel bad, imagine getting chocolate to feel better, and go and get chocolate. The more times we do that pattern, the harder it seems to break. What is needed is a wedge in the pattern. If you find yourself in a similar loop try this next time you are feeling low. Be aware that the craving has entered your mind. Straight away think Stop, Stop and imagine a big Stop sign. This is your cue to realise that you are needing some comfort. Remember food can’t actually comfort you, only you can do that. Take some deep breaths and imagine in your mind how you want to be. See yourself as slim, in control, happy and enjoying life. Then do something else, go for a walk, make a cup of herbal tea anything but give in to the craving. This will take practice, and willingness to experiment. It is worth every effort though! 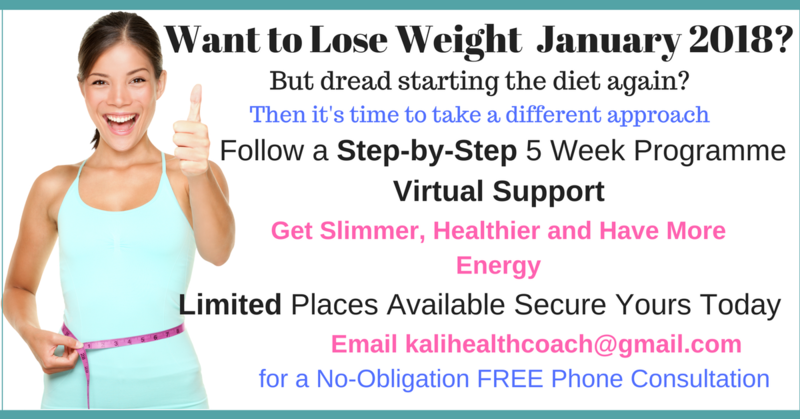 Is your New Year’s Resolution to lose weight and feel healthy? Have you wanted to lose weight now for some time? Do you feel like you’ve been stuck in a weight loss loop, going around and around yet never getting to your desired weight? The truth is, losing weight is tough. That’s a fact. But, you don’t have to be constantly frustrated with dieting. You can take control, using a step-by-step programme, with a little helping hand from an experienced weight loss strategist. I’ve spent 7 years now working with people to become slimmer, healthier and happier. The reason I’m passionate about this area of health improvement is seeing how losing weight can transform someone’s life. You can gain higher levels of energy, confidence, youthfulness and even more importantly, freedom from being stuck. I also know first-hand how frustrating it is to be constantly yo-yo dieting, training hard and getting nowhere but burnt out from the efforts. I thought I’d never be able to break the habit of comfort eating. I was constantly hungry, counting down the time when I would allow myself the next meal or snack. Monitoring my calories in versus calories out and never managing to keep on top of that equation. For a short time, it seemed to have an effect but would generally lead to a binge which ruined the small gains I had made. This felt like a self-imposed prison that I was trapped in. I searched high and low for the answers thinking there must be something wrong with me. Was I just hopelessly weak-willed or was my metabolism broken? What I learnt was that neither was the case. However, I found that I did need to regulate the hormones which govern weight-loss, primarily insulin and cortisol. Trying to lose weight by just cutting calories and training harder, doesn’t work long-term. If you are in a similar cycle don’t worry, it can be broken. And when you do break those habitual patterns by regulating your hormones, you achieve more than weight loss alone. You gain freedom from food. There is no magic diet, supplement or fitness programme. You still have to show up and implement what I will teach you to do. It is however, simpler when you have a structured plan to follow and someone supportive to be accountable to. For a weight loss plan to be successful it needs to encompass what you put into your body (food and drinks), what you do with your body (exercise, sleep, relaxation) and what you do with your mind. The New Year: New You (NY:NU) is a 5-week online programme which encompasses all these elements. The first week is all about getting you ready for the following weeks, so you don’t have to change anything immediately. Every week thereafter will be themed with a handout and worksheet to help you optimise what you eat, your lifestyle and mindset. You will have access to an app where your workouts can be found. In each workout is a video for you to watch of the exercise so you know what to do. If you haven’t got a gym membership, don’t worry, I can send you a programme to do at home. I will also train you personally in my private gym if you opt for the added personal training package. You’ll have access to me personally on WhatsApp to ask questions, keep accountability, send pictures of foodstuffs to check they’re ok and get any feedback on the worksheets you’ll be completing. This is what makes this programme unique. Most online programmes are an automated system where you’ll never get a chance to talk to speak to the person who’s organised the course. Whereas I’ll be available to help and support you every step of the way. What’s more, the skills you learn from this programme can be applied to any other goal you want to achieve in your life. So, what are you waiting for? Get in touch, email me today to arrange your free no-obligation courtesy call. This is a great way to kickstart your weight loss. /wp-content/uploads/2017/01/KH-LOGO.gif 0 0 Kali Harmen /wp-content/uploads/2017/01/KH-LOGO.gif Kali Harmen2017-12-08 06:35:502018-01-09 10:02:30NEW YEAR: NEW YOU 2018 SLIMMER, HEALTHIER, HAPPIER!!!!! This blog post is an accompaniment to the book Master Weight Loss for more details click here. If you have been following the book you understand now what keto-adaption is (your body has adjusted to burning fat primarily as its fuel source). Once you are keto-adapted you may find yourself being able to go longer periods without feeling hungry and maintain pretty consistent energy levels. When you get to this stage and are managing your weight loss/maintenance well you could try adding in some dietary variation into your schedule. If you are totally stuck on a weight loss plateau this could also help. What I mean by dietary variation is to add in some different foods, namely the ones you have been missing, carbohydrates. The caveat to this is choose good quality carbohydrates, we’ll get more into that later. Yes, this will mean you’ll be out of ketosis for a small period of time. The idea is to create metabolic flexibility to be able to weave in and out of a fat burning state. However, this may not work perfectly for everyone (more on that below). If you think about it, our ancestors had variation to their diets, it would have changed from season to season. They didn’t have a corner shop or 24 hr supermarket. This would have meant times of famine (no food) where they would have been in ketosis to survive. And also times where there would have been plenty. Like after a good kill when meat was abundant. Our ancestors would also have had periods of eating more carbohydrates (such as berries and potatoes), as well as times of consuming much fewer carbohydrates. This is unlike today when everything is available all year round. Sure, we don’t know exactly what your ancestors ate but we do know this, they did not eat pizzas, chips, biscuits, fast food and donuts. Perhaps we can develop some of this metabolic flexibility in ourselves. By simulating periods of not eating (fasting) with periods of eating more food and increasing quality carbohydrates on some days. The type of carbohydrates I’m referring too would be one portion (80g) of either berries (strawberries, blackberries, blueberries, raspberries), sweet potatoes, plantain, lentils and pulses per meal. The table above is an example of creating some dietary variation throughout a week. This may help you to also get past a weight loss plateau. Monday would start with a regular intermittent fast of around 16-18 hrs before having your first meal. Tuesday could consist of 3 smaller ketogenic meals. On Thursday a 24hr fast begins after lunch and ends on Friday at lunch time. Saturday is the day where wholefood carbs can be added. For example, if you wanted Saturday to be your flexible day with carbohydrates keep to 2-4 portions (80g a portion size) over that day. Eat the carbohydrates with protein and a source of fat. Alternatively, if you lift weights you may just want to have a source of carbohydrates with your next meal and then go back to your regular ketogenic diet. This may be something that works for you or not. As with many things in life you’ll have to try it and see for yourself. This blog post is an accompaniment to the book ‘Master your Weight Loss’ found here. I left this section out of the book as I wanted the book to be a simple guide to the ketogenic diet. From experience of taking clients through this dietary approach, most are not interested to measure their levels of ketones. This is partly due to not wanting the financial outlay. And many get a good result without the need to test. However, sometimes just following your interpretation of the diet does not mean you’ll necessarily get into ketosis. If your goal is to get into ketosis, you won’t know unless you test. 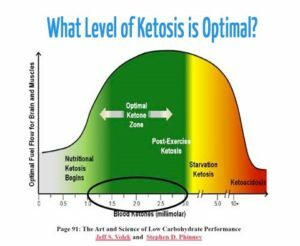 What Does it Mean to Be In Ketosis? When carbohydrates are restricted on the ketogenic diet, your body is forced from burning mainly glucose to using fat primarily as fuel. To satisfy organs such as the brain which cannot burn fat the liver produces ketones. Ketones are made from fat and used as an alternative fuel source. Ketosis means you are burning fat for energy and is a perfectly natural state to be in. Note: Nutritional ketosis is not the same as ketoacidosis which is a dangerous condition for a type 1 diabetic to be in (1). Does it Matter if I’m in Ketosis or Not? if your goal is weight loss then being in ketosis is an optimal place to be. The reason for this is, you’re able to access body fat for fuel, are more likely to find your hunger and cravings suppressed/manageable and experience good energy levels. Any diet where you are fighting hunger, cravings and your energy levels are poor will become an intolerably difficult, if impossible diet to stick too. 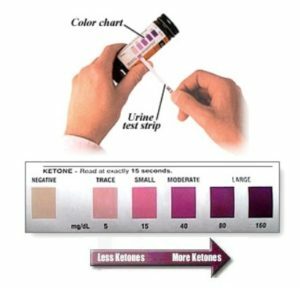 How Do you Test for Ketones? There are 4 ways you can measure ketones: I’ve kept this article as simplistic as possible rather than go into great detail about different ketone bodies. If you want to delve deeper into this subject a good book is The Art and Science of Low-Carbohydrate Living – by Volek PhD, RD, Jeff S. and Phinney MD, PhD, Stephen D.
The blood ketone meter accurately measures ketones. And is relatively easy to perform at home once you have the meter. It requires a skin prick using a lancer which usually comes with an all-in kit. The biggest issue with these kind of meters is the price of the test strips. These can vary in price depending on where you buy them from and the type of meter being used. The precision Xtra by Abbott is a reliable meter, though I’ve not seen the strips as cheap as the Keya Smart meter. The Keya Smart meter works out around £71p per strip once you take into account the postage of the strips. Keya are also bringing out a new meter especially designed for those interested in nutritional ketosis. When measuring blood ketones, the range for nutritional ketosis is 1.0 – 3.0 millimolar. 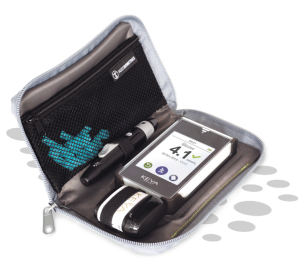 If you are not willing to spend out on a blood meter with the recurring fee of the strips then a ketone breath analyser might be for you. Once you have purchased a device you can keep reusing it without any additional cost. 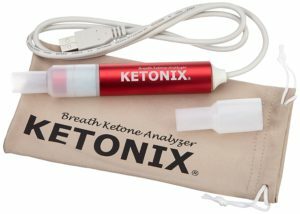 The breath ketone analyser does not correlate to blood testing as they measure different ketone bodies (3). The breath analyser gives a good indication to whether you are burning fats for energy. If you get a low reading, you’re probably burning glucose for energy and a high reading indicates you are using fat for fuel. Ketone breath readings can be skewed if you do not breathe into the analyser correctly every time, have recently; drunk alcohol, exercised, or even eaten a large amount of garlic (4). 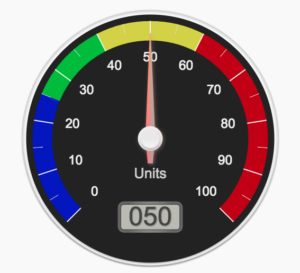 The Ketonix uses a traffic light system of colours to show your level of ketosis. The colours show on the device itself and also when you use the Ketonix software which displays an image resembling a rev counter. To use a breath analyser, you take a normal breath and then exhale into the meters mouthpiece, fully expelling all air from your lungs. This is important as the ketone concentration is in the last 15 seconds of air out your lungs. The needle on the rev counter will then show your level of ketosis. This is the cheapest way to test ketones but is only effective during the first 1-2 months of your ketogenic journey. The reason being, as your body gets better used to using ketones less spill out into the urine. Therefore, if you initially had positive urine strips, then negative results 1 month later but your diet hadn’t changed, it could mean that you had become fat-adapted. When you become fat-adapted your body has become efficient at using ketones for fuel. This is generally where you will find your energy levels pick up and you get the health benefits of the ketogenic diet. In a fat-adapted state which ever method you choose to measure ketosis may show lower levels of ketones than when you start. 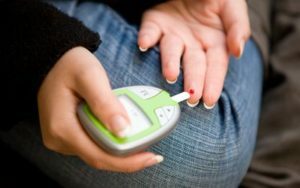 If you are exceptionally in tune with your body or you have used some form of testing in the first month then you may have a good idea to whether you are in ketosis or not. Some people notice it in their breath which can smell of pear drops or find their taste becomes metallic or sweet. You can also use your bodies bio feedback to give you clues. If you experience little to no cravings, can go long periods without hunger and have good energy levels you may well be in ketosis. I believe testing is important if you are not getting the results you want from trying the ketogenic diet yourself for at least 8 weeks. 1. Qiao Y, Gao Z, Liu Y, Liu Y, Cheng Y, Yu M, et al. Breath ketone testing: A new biomarker for diagnosis and therapeutic monitoring of diabetic ketosis. Biomed Res Int. 2014;2014. 2. Prabhakar A, Quach A, Zhang H, Terrera M, Jackemeyer D, Xian X, et al. Acetone as biomarker for ketosis buildup capability – a study in healthy individuals under combined high fat and starvation diets. Nutr J. 2015;14(1). 4. Anderson JC. Measuring breath acetone for monitoring fat loss: Review. Obesity. 2015;23(12):2327–34. If weight loss is your goal, what are you prepared to do to make that happen? Arbitrary thoughts of wanting to lose X number of pounds or be certain clothing size, isn’t going to cut it. Have you ever wondered why, this seemingly simple task of making better food choices, becomes a mammoth challenge? • Gym memberships and either not going, or not regularly enough, or only give a half arsed effort there. Don’t get me wrong all those things could work, but 99% of the time they probably won’t; why? Do you prefer having pleasure or pain? You may think what a dumb question. Who in their right mind would want pain? Exactly my point, well, unless you have some kind of quirky fetish that is. As a human being you are hard-wired to avoid pain (makes sense, you wouldn’t want to keep burning your hand by touching something hot). You are also wired to seek pleasure and conserve energy. Now you can understand why many diets are so problematic. If you want to lose weight, but think about all the foods you won’t be able to eat about, or having to avoid certain restaurants, turning down chocolates at work, having to prepare food in advance, battling with your cravings etc then all that does is equate to massive PAIN! Not exactly appealing or motivating…no wonder it doesn’t work! Your brain is wired to avoid pain. It’s the lure of having pleasure now that destroys weight loss attempts. How many times have you been on ‘a diet’ or ‘being good’ when something has happened at work, or you are stuck in Starbucks confronted with the cake counter, when that tempting thought drops into your mind? The OMG, that looks so good, the saliva starts to build in your mouth as you eyeball the cake/biscuit/muffin/pizza/chocolate, the feeling of pleasure builds up and the annoyance of having to restrict leads to a “just one last blow out, then I’ll be ready to stick to the diet” or “sod it, I’m miserable dieting”. Before you know it, you are sitting down with a tempting slice of whatever you choose that’s ‘off diet’ in front of you, at this point you’ve gone too far to turn back, moneys been spent and you have justified all the reasons why you’re ‘allowed’ to have this treat now. The instant enjoyment of that ‘treat’ in reality only lasts a few seconds or minutes before the reward quickly gets turned into self loathing and shame; fuelling the belief that ‘I’m not strong enough, or motivated enough, or there’s something wrong with me’. None of that is true! We all crave pleasure, which is why if weight loss is your goal, it has to become pleasurable, right now! When people talk about their weight loss goals, I hear a lot of, when I get to X pounds then I’ll be happy. Let’s just look at that. If, for example you have two stone to lose, that could take 14 weeks or so. Which, is not a long time in reality, it only seems a long time if you see pain for 14 weeks. To stick at that would be near on impossible! 14 Weeks of pain, not very compelling is it? Feel good right now about losing weight, seems obvious, but you may wonder ‘how am I going to do that?’ especially when diets, restriction, etc equals pain. This is my take on it, step by step. 1. Write down your goal. Your goal needs to be pleasurable, such as; having more energy, a toned slim physique, buying cool clothes, feeling more confident, achieving want you want in your life etc. Know why you want this for yourself, get it down in writing and find pictures to illustrate your words. Carry your goal around. Everyday imagine yourself as your new physique and feel great about it. The more excited you can be about this and imagine it in your mind, the more your unconscious mind will connect to what you want and help you to achieve it. 2. Work out your strategy: how much exercise are you going to do – what will you do to make that more pleasurable? For example, I love listening to podcasts when I walk. Not only am I exercising but also getting an additional education at the same time. 3. What is you nutritional strategy going to be? You can still lose weight and eat amazing foods! If you don’t know how, get in contact. 4. Have an affirmation that you constantly repeat to yourself, such as every day I am getting healthier and healthier, or slimmer and slimmer. When you say this to yourself, picture yourself in your mind at your goal weight and feel how that will be, how confident, positive etc. This way you are bringing pleasure into the moment and feeling good right now! 5. Google some recipe ideas, there are tons out there. Find things you would enjoy making, have fun being a culinary whizz. Doesn’t matter if you currently are a can’t be bothered to cook type, anyone can learn to make simple food! 6. Change what you think about yourself, for example if you think of yourself as being fat, then you’ll stay stuck. Remember the Nike advert, with the words “I am an athlete” next to ordinary looking people. Whatever we call ourselves we become, so give yourself a fun title. Every time you turn away a chocolate bar, or stick to your plan etc, pump yourself up, feel good, because the more pleasure you can feel now the more you will be compelled to lose weight and stick to your goal. If you feel good every minute, hour, day that goes by that you stay strong that is more empowering, more thrilling, reshapes the way your mind works, changes your life and every single future goal you do…. That’s how to get pleasure losing weight now, even though it may take some time for your body to look physically how you want. And that bit is just the icing on the cake that will come when you’re consistent with seeking pleasure by choosing to be healthy instead taking the quick fix that only brings long-term pain. If you want a fun way to get fit, join me for some weekly classes going to start on Tuesday and Thursday mornings, email me to find out more. This is something I’ve heard all too often over the years…It’s ok if I eat ‘XYZ Rubbish Food’ I’ll burn it off at the gym. That approach simply doesn’t work. In fact you will be forever chasing your tail with that approach. Which is why you see so many people at the gym, pounding away doing the same ole cardio week in, week out. Yet, never getting to that body shape they are so desperately trying to achieve. Think about it, if it takes roughly an hour to burn 493 calories in a high impact aerobics class for a 157 pound person (11.07 stone) then that’s a lot of sweat and effort to burn up last night’s dessert. To keep eating the same foods, and then exercising like crazy to hope to keep off the extra calories, is not an effective strategy, not only is it demoralizing but why go through all that stress? Eating the diet we were designed to eat will keep you from feeling hungry, give you more energy and allow you to strip off the fat. We were designed to eat food which can be pulled from the ground, plucked from a tree and also hunted. We were not designed to be eating processed, Frankenstein foods. Lifting progressively heavier weights will give you an athletic looking physique, when you get your body fat low enough to see the muscle under the fat. So ladies do not be put off by lifting weights, you won’t suddenly end up with bulging muscles and a square jaw…unless you start taking steroids that is. Which is how women end up looking like guys. We produce little testosterone and don’t pack on muscle that way. Training 2-3 hours of weights a week will simply not turn you into a muscle Mary. Muscle does burn slightly more calories at rest than fat alone. This is one reason why shifting that fat to muscle balance works in our favour. Strength training places extra demands on your body which is necessary to develop a toned physique. When you strength train it causes microscopic tears in the muscle, don’t worry that’s what we are trying to achieve! In the recovery time it repairs and builds new stronger muscle, strengthens tendons, ligaments and muscle tissue. Weight bearing exercise also increases bone density which starts to gradually get lesser as we get older, and for women especially after the menopause, so it is one of our defences against osteoporosis. The bottom line is to get the right nutrition in place otherwise you may never reap the rewards of your hard work. Train hard, lift weights, get the heart rate up and enjoy the challenge, not only will your body become stronger but your mind will too. There are many reasons why your resilience may be under powered such as; an underlying infection, past or current medications, unhealthy food choices, negative lifestyle habits, lack of sleep, sub-optimal thyroid function, stress (real or imagined) and poor gut health. I know only too well how it feels to be burnt out, fatigued and unhappy with my weight gain. I also know that life doesn’t have to be that way. Sure we will all have times when our workload stacks up and life seems to get in the way of taking any time for ourselves. It is in these times though that having robustness is crucial to prevent overeating and continual tiredness to set in. We all have the chance to make a stand for our happiness and take charge of our health. Sometimes illness makes this difficult or even impossible to regain full health. The point however, is – to be at the best level you can be for your circumstances. If you are still breathing and not yet fully engaged in enhancing your health there is hope for you to make some improvements. Once you develop greater resilience by enhancing your exercise routine and optimising your nutrition you will find you can live your life with more ease, happiness and fun. Weight loss will become easier as you are not fighting hormones driving you to overeat. You will find a greater bonding with yourself, as you are taking care of what really matters in life which is you! If you have resilience you will weather life’s knocks and bounce back. You will be more able to take on projects/ workload and have better relationships with others. Hi there, I just wanted to welcome you to my blogs. The blogs will be on anything health related, some articles more complex than others. If there is anything you are interested in specifically, please let me know. I’ll consider researching the subject if it’s of public interest. I want to just say this now, science changes and new research comes out every day. All of us in the field of nutrition and fitness/strength training have a tough job disseminating the information available at the time of our writings. I will endeavour to be as accurate as I can and as more data is available I will update my work accordingly. If you spot a problem please let me know so that I can look into it and correct it if need be. Not the little grammar mistakes though, which may be many (sorry about that) but anything technical or related to the subject matter. Many thanks and I hope you enjoy reading!